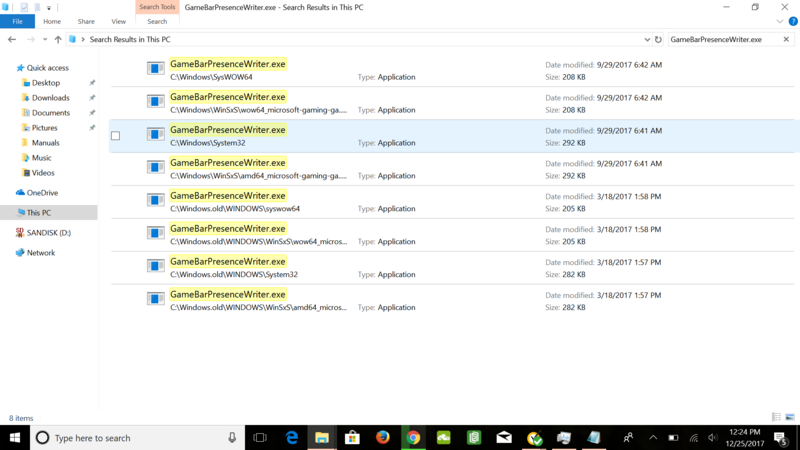 I know that GameBarPresenceWriter.exe is an xbox folder thing.. but I have seen multiple exe files of these. Some in System32, some in syswow, and WinSxS. I've ran Norton and Malwarebytes scans on them, and results turned out good. Although.. I am still very concerned. What should I do? Here is a photo. For peace of mind, I would suggest a visit to one of the Malware Removal Sites. They can help you to check out your computer to see if it has any malware. Please pick 1 site and stay with them until they say your computer is clean. Register with one of them and tell them what has happen with your computer so far. Please come back and let us know what the results are. Okay, I am using qmalware removal. Do I have to give them access to my computer? I just created a forum there. No, none of the removal sites remote in. Everything is done by running different scans and the expert interpreting the results. He then tells you what to do. Its a 1 on 1 session. Each fix is made for that particular computer. Okay, thank you! How do I contact someone to do a 1 on 1 session on qmalware removal? I've created a forum about it, will he/she just start the conversation there? Have a good day/night, thank you!